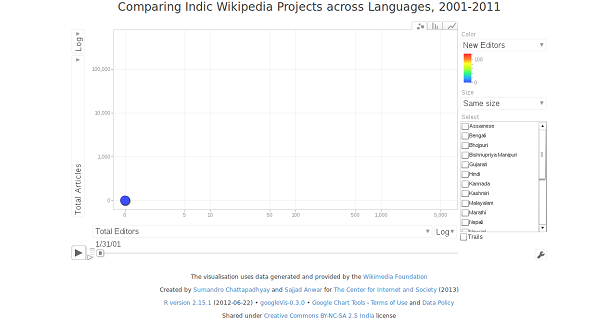 Sajjad Anwar and Sumandro Chattapadhyay bring you a visualisation of the growth of Indic Wikipedia in this first post on Indic Wikipedia Visualisation project. In doing so, the authors look into the different aspects of the past and present activities of Indic Wikipedias, and divide the visualisation into three different focus areas. We explored the MediaWiki API, ToolServer and the Wikimedia Statistics Portal. 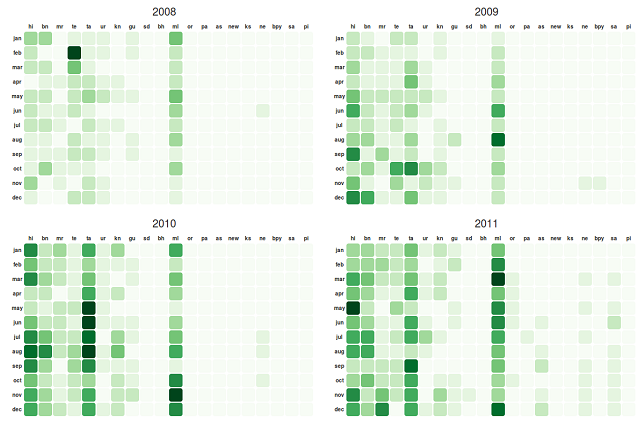 These are several ways of obtaining data about Wikipedia in general. Depending on the use case, such as the quantity of data required or the need for customised/selective data scraping, any one or more of these methods of data gathering can be chosen. The API had limitations in terms of how much data you can access, and it is meant to be used to access actual Wikipedia entries. We, however, were looking for metadata about the entries/articles (such as when it was first created, when and how many times it was edited, etc.) and not the actual entries/articles, that is the actual contents of Indic Wikipedias. ToolServer is an excellent way of running custom scripts. Although, this takes for granted that user (of ToolServer) has substantial command over the back-end infrastructures and processes that Wikipedia runs on. We wrote a few scrapers to extract metadata about Indic Wikipedia projects from the ToolServer but not exactly being experts in the Wikipedia back-end systems, we found scraping from ToolServer rather time-and effort-intensive. The statistics portal is a well organised and an accessible place for collecting data for analyses. However, we came across several missing parameters and projects, that is the statistic portal did not have all the parameters and Wikipedia projects we were interested in. In our search for Indic Wikipedia datasets so far, we realised that the Wikimedia Analytics Team (WAT) puts a lot of effort in writing scripts and collecting various data at different levels. Wikimedia developer Yuvi Panda and the Access to Knowledge team at CIS, aware of our difficulty in obtaining the data, also pointed us towards the WAT. While we were already scraping data on some of the parameters, we approached the WAT whose prompt and very supportive response much accelerated our work process. The fantastic Wikimedia developers, especially Evan Rosen (a big ‘thank you’ for him) shared the needed data, which we cleaned up and archived at the Github repository for the project. Like the new articles, we wanted to explore the patterns in the number of new editors across all of the Indic Wikipedia projects. As you run through the new editors calendar chart, it is evident that there is consistent growth in the editor base for few projects like Hindi, Marathi, Bengali, Telugu, Tamil, Kannada and Malayalam. If one takes a step back and compares this with the number of new articles chart, something is not very clear -- in some of the projects, there is a growth in the number of editors but not many new articles are posted. We are very keen to understand why this has happened. We chose to configure the X- and Y-axes to show the data in logarithmic scales and not in linear scales. Since most projects experience small increments over time and there exists a wide difference between the most and the least popular/active projects, the logarithmic scale is better suited to represent the changes in the given data. The user has the option to select linear scale at the end of both X- and Y-axes (click on "Log"). Sajjad Anwar is a programmer based in Bangalore. Sumandro Chattapdhyay is a researcher based in Delhi. They often work together. Awesome .. Please include no of edits and admin growth in phase 2 if possible.